The Vuelta doesn’t have many mythical climbs, there’s no Ventoux nor Stelvio but the Lagos de Covadonga are the closest the race gets, a climb that’s been a regular since the 1980s and climbed for the 20th time today. 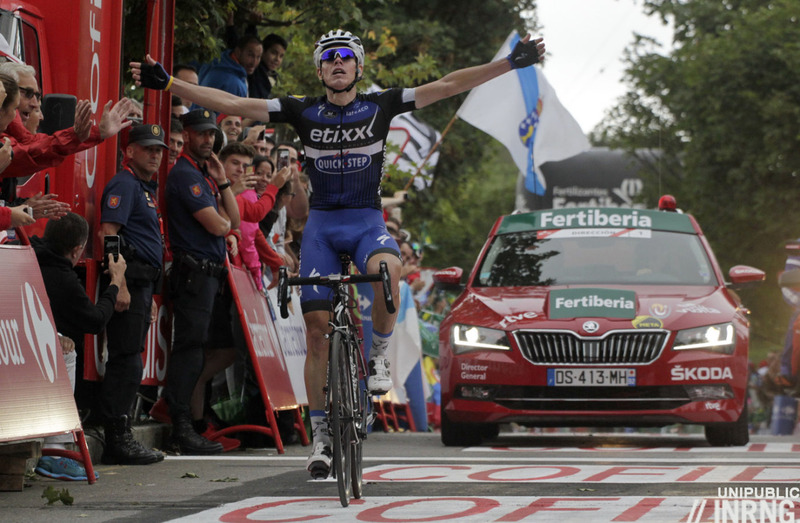 Stage 9 Wrap: David de la Cruz won the stage after surging past Dries Devenyns late on the climb of the Alto de Naranco. Riders often look happy on the podium – although Thomas de Gendt managed to collect the mountains jersey without barely smile – but de la Cruz was beaming on the podium like a boy who’d just been given a dog for Christmas, kissing the red jersey and giving Esteban Chaves’ smile a challenge. Behind the main contenders marked each other, happy to wait for tomorrow’s stage and if Nairo Quintana lost the overall lead he’ll probably be pleased about it as it means Etixx-Quickstep have to do some work tomorrow instead of his Movistar team. Still if all the contenders finished on the same time Alejandro Valverde looked lively as he chased down local rider Samuel Sanchez and the others took a moment to react. The Route: 188km. A start in Lugones and after the sporty town of Gijón the race follows the coast until the the halfway point at Ribadesella where the race begins a circuit and climbs to the Mirador del Fito, 6.2km at 7.8% average and with 10% ramps along the way. The Finish: the climb should be familiar to readers and riders alike as a staple of the Vuelta. It’s 12.km long at 7.2% average but a very irregular climb with constantly changing gradients, a staircase climb. The chart says 17.5% at the finish but this looks odd, after the descent by the lakes the road rises and it’s not so steep. The Contenders: Nairo Quintana was the surprise on La Camperona, attacking and then pulling away but it’s still hard to tell who is the best because no sooner does one rider look good they have a reversal on the next mountain stage. Still Quintana and Alejandro Valverde look like the ideal pairing for this stage finish, Quintana can go on the climb proper while Valverde can mark and then use the small uphill ramp to the line to sprint. Chris Froome has beaten expectations so far with consistent riding even if he’s not the force we saw in July. A stage win here is possible but the uneven climb and the flat portion across the top might not suit. The same for Alberto Contador who surged past Froome two days ago despite being swaddled in bandages but if Contador could do that with his limbs and shoulders resembling a pizza margherita then imagine what a couple of extra days of recovery can do. Esteban Chaves needs a result. He looked fresh on the Ezaro climb but suffered on La Camperona and can’t afford any more time losses here because he’s behind Quintana, Valverde and Froome overall and they’re all superior in the time trial. If he’s going backwards here then even a podium finish is going to be a challenge. Simon Yates has been erratic but could be close too. Caja Rural’s Sergio Pardilla is climbing well and is almost four minutes down overall so could have room to go clear. I wouldnt say Cannondales GC hopes have gone. Talansky is still up there, and these longer climbs suit him a lot better than the steep ones theyve had so far… Also he is a very good tt rider, so i would still call him a top 10 candidate, and maybe even a potential top 5. Thanks for the review, as always. I would have thought the uneven gradients and flat part would suit Froome? Looking forward to finding out. The weather today suits Quintana more so than Froome too. I wonder if he, and Movistar, will make hay while the going is good? David Millar on ITV4 suggested he needs to, and they have the strongest team. How about Sky do something creative and put Konig up the road, to force Movistar to chase? The breakaways battles are great to watch but a nightmare to predict. Having said that, the carrot of bonus seconds should also force Movistar’s hand too, so perhaps today may be all about GC. Difficult day yesterday: a good Vuelta stage, a very good GP de Plouay, a very good Schaal Sels. Hard to choose what to watch. Lovely. I don’t see Etixx working that hard to protect de la Cruz’s jersey. Its almost a dead cert its one and done in red for him anyway. So I expect a token effort until the cat 1 climb with Movistar looking over their shoulder. A good performance from Quintana today may well badge up the fact that Froome is too off the pace to compete here. So it really is about if the Colombian can hammer home an advantage or the Briton can “hang tough” as it were. Froome doesn’t need to win or gain time. He just needs to be a limpet that can’t be shaken off. There are still ten stages to fight for after this and Froome may yet have better days. I don’t see Contador making much of an impact. Even Froome (before he blew up) had dropped him on La Camperona and he seems unable to go with attacks and we’ve seen this earlier in the season too when he takes on the very best. 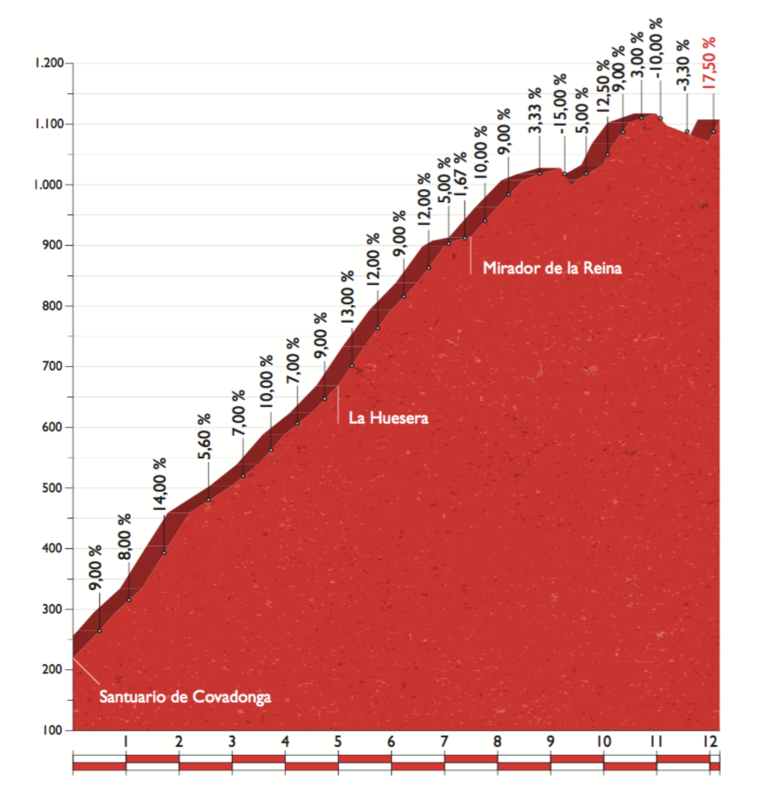 This climb is much longer than the other day and dropped Contador may not come back this time. Ditto Chaves who I just think is racing with guys a class above him. But he’s young and will only get better. All in all, I expect Quintana to show once again that he’s the man to beat today. I’ve been wondering if we’ll see a fresher Chaves in week three as he’s the only contender not to have done tour (or in Contador’s case tried to peak for it). I can see it that if he holds tight this week and loses no more he could run away with it in week three. I’m hoping so anyway. I would think that there must be a good chance that a breakaway will stick. The last two times that they finished on the Covadonga, the stages were won by riders from the break. Please remind me when earlier this year a healthy Contador was dropped by a big GC guy? I remember once by Q. Try stage 5 of the Dauphine when he was dropped by at least Froome and Porte (and I think Bardet too from memory). Agreed – Contador is still classified as “healthy”, plus he didn’t finish the TdF so in theory he should be fresher and fitter than his rivals. I’m shocked that the other TdF finishers are doing the Vuelta, especially after going to Rio too. Finally got my Eurosport Player/VPN setup to (sort of) work here in the US of A, complete with my favorite Italian commentary. Venga Condor! Excellent stage and I must say a masterclass in measuring what effort was in the tank by one C Froome. Quite so. I wonder if he’d be able to do it without a power-metre. With a little help from the DS’s car! Quintana has a power meter too. You imagine he never looks at it or its there for show? Q was playing with the head unit before the final push. Puns unintended. I caught that as well. Noted that I’d have been somewhat less composed and probably unable to see the damn thing, much less thumb through the screens as he was doing. Careful Ferdi, we don’t want to mix up sport with these science projects now, do we? I was thinking about some other draconian rules I’d enforce in addition to banning ANYTHING electronic on the bike if I was the king of pro cycling – Handlebars for HANDS, no elbows, wrists, etc resting on the bars in a simulated chrono bike position. SADDLE for sitting, none of this top-tube silliness. When someone finally wobbles off at high speed and gets seriously hurt, the UCI will act to ban this, hopefully before bikes start appearing with specially-shaped, sloping top tubes designed to be sat upon. In this case, after the exciting climb we saw today, it’s impossible not to wonder what these kind of stages would be like if riders had nothing to help them pace themselves, other than just their self-knowledge, self-perception, and on-the-spot intuition, all of which would of course be emotionally biased and wonderfully sub-optimal. HA! “…..if riders had nothing to help them pace themselves, other than just their self-knowledge, self-perception, and on-the-spot intuition, all of which would of course be emotionally biased and wonderfully sub-optimal.” has no value…except perhaps that’s exactly HOW the SPORT became popular in the first place? Nah, that can’t be right – it must have been all those technical developments – the switch from iron wheels to wood or the exciting adoption of toe-clips and straps, pneumatic tires, etc. THAT’S what made the sport what it is today…so we must allow the bicycle to continue to evolve, lest we lose the short attention span of those who fixate on equipment and commerce and care little about sport. handlebars and the seat on the saddle. Yet we see plenty of competitors violating these rules (which is why I thought the king should impose them) with impunity. Inconsistent enforcement of the rules (sticky bottles, hanging on to vehicles, etc.) has been a problem for quite a while, yet the UCI doesn’t seem to care much? Or is it just too much trouble to get the various officials in-charge to act in unison? After a couple of warnings DQ’ing a Sagan or Nibali would likely put an end to these violations of the rules? AHEM, Nibali got penalised for hanging onto a car last year – there are still rumours of sticky bottles or hanging onto car doors! On this issue, an interesting recent study found that cyclists with no feedback at all (speed, distance, power, elapsed time, heart rate) performed just as well, statistically, as those with access to all that information during a 20K time trial. Normal caveats apply (small sample size, etc), but interesting to see. I suppose it could be argued as supporting either side of the debate – either the power meters don’t matter, so get rid of them, or they don’t matter, so riders can keep them if they want! Interesting, but no time to read the whole thing, although it seems to me more nuanced than your conclusion. At any rate, if the device really makes no difference to the performance, there is no way it supports the point of keeping them, since allowing devices must be based on what they add to the race, not just on what they don’t or might not detract. The burden of proof is on the technology, and on the rider who wants to use it. The study you mention particularly emphasizes that a “learning effect” can change the conclusions if the test is repeated, because of the knowledge gathered in rehearsing the exercise. Which is the problem with Sky (and others): it all seems well-rehearsed. Some say that it has to proved to that a device harms racing. I say the opposite, that it has to be proved that a device improves racing (as opposed to merely improving a rider’s or a team’s performance). This is the “burden of proof” discussion. What a cracking stage that was. My enemy’s enemy and all that. Quintana wins again. But it wasn’t a knock out blow. Half of the competitive stages are now over and there’s half left. Quintana has a minute on Froome. But can we expect Froome’s second half of the race to be his best half? And can Quintana maintain his form to Madrid? What roll will the 37kms ITT play? I would expect that Quintana needs to double his lead to Froome to feel safe since the latter is a master at pacing himself. If Froome comes on strong from here on in I don’t think Quintana has much more to give than we have seen. I feel Q needs about 2 minutes before the TT and he will struggle to get to that buffer. I predict Froome me will win this Vuelta by less than 30 seconds. Valverde will have to decide if he wants Quitana to win or himself on the third step of the podium. Contador will miss the podium because that’s never his aim. Nor should it be. He’s loved for this all or nothing mentality. I’ve just read a Quintana quote from after today’s stage where he says he needs three minutes on Froome to not worry about the ITT. Interesting stuff. Seriously?, Froome took 2:05 min at the last Tour de france ITT. The present conditions are quite different to what we had two months ago, the tables are turning. Quintana is in good form and Froome is not as dominant as he was. I would say he should take 1:00 to 1:20 max over Quintana on the ITT and then is “mano a mano” at stage 20. Is going to be a very interesting finale at this Vuelta. If Quintana crashed Froome would win at a canter. Assuming Quintana doesn’t crash I think this race will be decided by seconds. I think today did inflict some knock out blows – going from 14 riders within 3 mins of the lead / 6 within 2mins down to 6 and 3 has surely put paid to many riders thinking they could reach the podium. The rest day will have a lot of ‘what now’ discussions if they hadn’t expected this to be the case at this stage. I’ m pretty sure most guys knew the pecking order by now. It’s time for more creative racing, but many sponsors are more pleased with a top 10 than a daring attack that has low chances of getting that rider a top 5 or better. There are some champions in the peloton that will take that chance, but too few. When it happens it’s thrilling to watch. If it work it’s something historical. Yesterday’s stage summed up why I don’t like Froome as a cyclist (I’m sure he’s a nice fella). The so obvious checking in with the team car and then pacing himself with his power meter up the climb. I’m sure others do it, everyone else might do it, but he does it the most obviously. It looks like he’s asking when he can go and at what watts, like he has his 20 minute max so he’s asking at what point there’s only 20 minutes left. It might not have been that, he might have been asking what the chef had on for tea and he might be a weather nut watching the temperature drop with altitude but it’s unlikely. He’s the rider most obviously dependent on input from others, be that 6 team mates working for him at the TDF or this. Add that to the fact that he looks like an absolute bag of spanners on the bike and I don’t think I’ll ever be warming to him. Something needs to be done to restrict radio usage so it’s only for emergencies, I’m not so sure Brailsford will want to shout Froomes wattage out the car window. what I really like about Froome/Quintana/Contador/Valverde is that they all race in different ways… that was what made ydays stage so fascinating… sure Froome chats on his radio/looks at his stem/sticks his elbows out etc, but it’s the contrast that makes it compelling. If they all did it, sure it would be annoying, but they don’t. There’s also an argument that the way Froome rode yesterday was what made the stage exciting – would everyone else have attacked as much as they did if it wasn’t for the fact that they saw Froome was behind them and thought he was in trouble? +1 I like your final sentence especially. Combine the “fog of war” with everybody knowing what’s going on when it comes to the DS yelling out the car window vs secret whispers into the earpiece. A simple ban on ANYTHING not powered by the rider and any sort of energy storage device would suffice. Even a simple cyclometer is pretty useless as the distances are marked and called out constantly. Electronic shifting is useless as mechanical systems work just as well and power-meters and GPS stuff are totally unnecessary. After all, sport is DEFINED by inefficiencies. Interesting idea, ban any electronics/devices that are not powered by the rider. Therefore, battery packs are banned which means that any electronic shifting, gps, power meter, heart rate monitor, or radio has to be powered by the rider. Maybe for the sake of this, because it is easier to put this in the riders’ bib pocket, allow radios (but somehow restrict access, or make it public, like in F1) – and because radios take virtually zero power. However, any other systems have to be powered by the rider. I’m not saying I support this idea, but it would be interesting seeing how it plays out. That would be interesting – a little generator (but no battery to charge up on the descents) powered by the rider’s efforts used to power all the gizmos would REALLY test their priorities in a world of “marginal gains” measured by single-digit savings of watts. Would any pro put effort in create electricity rather than propel the bike itself, just so he/she could have the “benefits” of the various gizmos? I’d still rather just ban ’em all but your idea is interesting nonetheless. So much conjecture in one comment. Where to begin? Well by noting that Sky’s Ian Boswell said today in a Facebook chat with Richard Moore that he always rides by feel and not power meter readings since in a race they are actually pretty useless. A real race is not a training scenario or technical exercise. You always need to respond to others and not race to a graph. The race is on the road. Clearly Froome doesn’t follow this “race by feel” philosophy, and which rider (Boswell or Froome) is at the pointy end of affairs here? The race is on the road, and Froome religiously checks his power output while racing for GC. I honestly agree with Boswell’s approach, however it isn’t relevant as he’s not part of the discussion here. They’re talking about the GC riders’ approaches and that Froome doesn’t surge with others if it would take him into his red zone – a zone he can follow by LOOKING AT HIS POWERMETER. Froome followed this exact approach to make an excellent recovery yesterday, therefore riding by power meter is the exact opposite of useless. Froome races on a graph, Boswell doesn’t race on a graph, which racer is looking to win his second GT for the season? and now Quintana weighs in. I’m liking “The Condor” more and more! Agree Richard S, it just so reminds me of F1, Now Nico, your nicely ahead so turn dial A to postion 3 and press the blue button now and we will guide you home and the software has worked a treat again, well done Nico. Its the age of the techo geek and its allowed to happen, bloody wrong in my book! Just to add, every time I see him chatter into that mic it bloody well annoys me to the point of just wanting to switch off. Unnecessary comments about Froome above. Was Quintana prompted to make a move by Contador? Would he have been so daring on his own? This time round it’s Movistar that have the strongest team but I don’t hear any complaints about that. Yet it still takes a bandage-swathed Alberto Contador to stir things up? As for the TT, we’ll see. It runs north to south, along the eastern coast and if the Scirocco blows it could affect things as much as the southern Franch stages in July. Contador today has also said he was too impetuous in initiating the attack which sparked Quintana to life. He thinks he should have stayed in the wheels a bit longer but acknowledges he’s just not that guy. I think Froome was riding his own race and I’ve read he was chastened in his approach by his going too soon on La Camperona and then blowing. Interesting re the usual “robot Froome” comments that he said that he rode the climb more on feeling, because he had blown on the last mountain top finish, and having blown on the Covadonga before. I don’t believe that. I don’t believe someone racing in instinct and feel lets their immediate adversaries get away from them, you stick with them as long as you can. You lose energy in the wheels etc, it’s the first rule of road racing. I know what he does works but it’s not what you’d do instinctively. Quintana has set his stall out that he needs to take time, so It’s a bit unfair to be saying he’s negative. Seems to have ridden smart and maybe with his confidence restored he can be even more proactive- not sure about the parcours but I’m guessing there’s a few more mountain finishes. It’s the Vuelta right! To flee or to attack – or for some of us, to freeze – there’s an instinct for you. But in racing instinct is nothing but the sum of experience guided by whatever acute intellect is left under the pressure and in an exhausted state. Instinct tells us that what has worked in similar situations before is what to do now. Instinct also warns us not to do what didn’t work before (on several occasions or on one memorable). I have no doubt that what instinct told Froome was very much what we saw and nothing else. And a big +1 to Noel’s comment above. Three-four riders, all with a different *instinctive* approach to big mountain finishes makes for exciting racing. Maybe you do Richard but does that mean everyone else does? Nope. We have seen Froome over a number of years pacing himself, especially in the Vuelta. You may wish that he was a “fight for the wheel” type of racer but he isn’t. He paces himself as well as he can. The fastest way to the top is always the one that parcels out the available energy most efficiently. Just ask Contador.